What is a FUS or Field Upgrade Software? Do I need it? And what happens if I don’t have it installed. Here are my notes from the Field that I think you will find very helpful. 1) Plan for a downtime window to avoid calls to the help desk that the wireless is down. 2) Prepare your controllers by backing up the configuration. 3) Make sure you have the software and FUS you need before arriving on site. If deploying remotely– plan ahead and setup a local TFTP/FTP server for file transfers and place the software on a server local to the site to avoid firewalls and slow transfer speeds. 4) If possible be ONSITE physically to monitor the device(s) Or at least have a local out of band terminal attached to console port. 6) Large Sites that are High Touch Five Nines 99999.% Work in pairs to upgrade and monitor the controllers and check the configuration and test after reboot. However if this is an old hat for you then by all means do it by yourself. 7) Log your session and watch the output from the WLC Console session when upgrading the FUS code to check for anomalies since the FUS will reload a controller twice. 8) Know what you have before you start. Preform a show sysinfo at the command line or Monitor=Summary page of the controller. For controllers that do not have a FUS applied e.g. older Factory Fresh WLC’s will show Field Recover Image Version 6.0.182.0. This means that the controller most likely came from the factory with older controller software. Don’t worry this is all good. Manufacturer’s Name………………………… Cisco Systems Inc.
With only the initial release FUS image version 1.6.0, you will need to plan for more time as you may need to do multiple upgrade steps as you should go from one FUS to the next. The reason I stress this is if you need to move to a particular release because you are waiting for other controllers in the domain to either be phased out (e.g. Cisco 26xx/44xx/WiSM1. Its entirely possible that you may have to sit on a older release code for the time being. I know I will get a lot of questions on this and I know Cisco officially does say you can go directly from base FUS in the example to the latest and that may work—- but here is my two bits from field experience. “In some cases for more complex sites, you may have for example: a foreign controller(s) with software WLC code 7.0.235.0 on a 4400 platform mixed with WLC 5508’s with mixed code 7.2.x and 7.4.0.x in the same site. Along with Guest Anchors that are 4400 or WiSM1’s Ideally this is not the best practice or design, however I run into this more often then I want. Field Upgradable Software Version History to date. FUS Base code Factory 6.0.182.0 WLC Codes Ranges 6.x.0 — 7.0.230. FUS 1.7.0.0 WLC Code Ranges 7.2.235 — 7.3.112.0. Future FUS x.x.x WLC Code Ranges 8.x.x Can’t comment. Will repost when more info is publicly available. 9) What to expect at then end of each FUS upgrade. DO NOT upgrade two controllers in the same site at the same time. Test your first controller before repeating the process to a secondary controller. You may need a back out plan and a secondary controller might be a good insurance policy. Also this can help in speeding up the downtime. Upgrade times are lengthy. FUS times are at least 40min for 1.7.0.0 and 45 min for 1.9.0.0. This does not take into account the load times of the FUS or software being transferred and loaded and reboot times. In a site with two controllers plan for 5 hours (includes site walk through testing of Access Points). In some cases you might encounter an older access point that did not or will not upgrade to a new version or is stuck. Keep in mind that this is a very rare occurrence and I have come across it twice, with both 1131 and 1142’s (AP lights up and beacons but nobody is home). Software upgrades will be time consuming on older software platforms. 5 hours? Well yes, remember that when you are upgrading multiple controllers FUS and Software code. This means that you should plan accordingly and provide an outage window so you can back out if needed to a earlier code release if needed ( but rarely ever seen). Controllers AP software updates can be time consuming as when dealing with 300+ AP’s at a site. 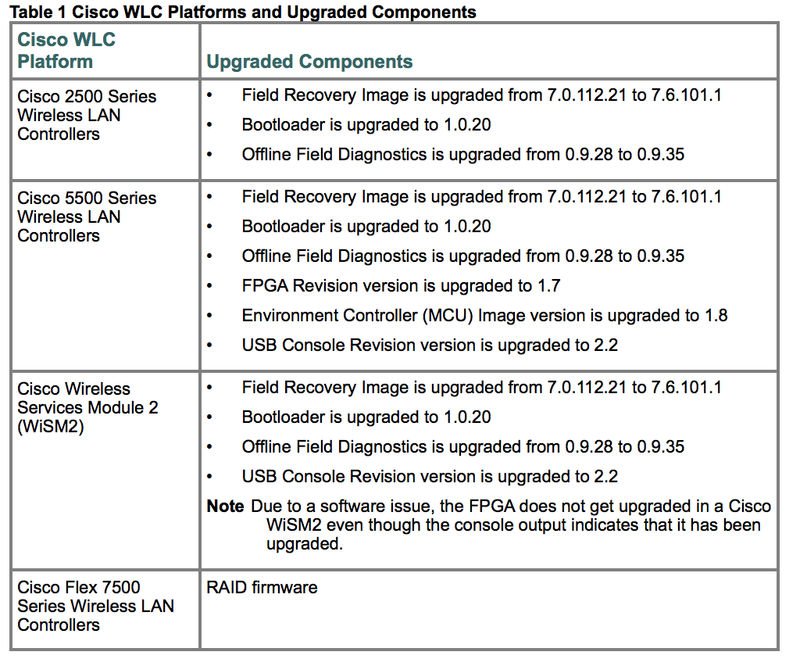 When you upgrade the Cisco WLC to an intermediate software release, you must wait until all of the access points that are associated with the Cisco WLC are upgraded to the intermediate release before you install the latest Cisco WLC software. In large networks, it can take some time to download the software on each access point. Feb 10th, 2015. Updated Code Table Snapshot from the updated Release notes. Thanks for clearing up a lot of confusion about the FUS image. I am planning to upgrade to the 7.4.110 OS version, but am unsure if I need to upgrade the 1.7 or 1.8 FUS image first and then upgrade the OS to 7.4.110. Judging from the output I’m a little confused about the Field Recover Image Version and the boot loader combination. This looks like you obtained a WLC from a previous Beta code deployment. However never fear in this case you can upgrade directly to 1.9 FUS AIR-CT2500-K9-1-9-0-0-FUS.aes = Field Recovery Image Version 7.6.101.1 and remember please DON’T double install the FUS 1.9. Also as a reminder the 7.4.110 code is now deferred. My recommendation is the Cisco 2500 Series Wireless Controllers Release 7.4 Software AIR-CT2500-K9-7-4-121-0.aes	safe harbour MD release. Thanks for the reply. I am going to upgrade the WLC with FUS 1.9 first and after that i will upgrade the code to 7.4.121. I am undergoing the FUS install right now on the 2504 Controller, 1.9.0.0. Reading your experience notes does help and thank you for tracking and posting them. Can this be done using GUI? or through CLI only. You can upgrade any controllers Software via the GUI or CLI. What you want to do is at least monitor the output of the Console when doing a FUS upgrade. I highly recommend it. I was expecting to see something else.. But, I’m cautious to do another upgrade.. Thanks for your notes Stew, they certainly clear up what the release notes miss. Sorry, my question is for Stew. Hi Av, Your Question was “Do you upgrade the FUS first and then the WiSM2 software, in that order?” Yes, I would recommend you install the AIR-WISM2-K9-1-9-0-0-FUS.aes Then move to 7.4.x.x and above. I thought the FUS and OS were independent – no best practice on order. So image before FUS in this instance if you are below 7.4.121.0? I upgraded to 7.4.121.0 but held off on the FUS since I was on 1.7 and it isn’t urgent to go to 1.9 unless you are below 1.7. FUS 1.9 is critical because there are things going that the OS will be dependent on once you start running 7.4.121.0. e.g. AVC profiles. I highly recommend that you have the latest FUS installed to avoid any issues that could arise. I have similar problem like Tim. Can I upgrade Field Recovery Image Version with fus 1.9 because bootlader is already 1.0.20 and i don’t want to double install the FUS 1.9? From what I can see, your version numbers are in check. Which means you have already applied your FUS 1.9. My question is: Can I upgrade my controller with FUS 1.9 (to upgrade Field Recovery Image) or can’t (because I will double install FUS 1.9 (Bootloader Version is my biggest concern) and crash controller)? Hi, i interrupted the upgrade process too early. Now the wlc hangs at the bootloader. Can the controller be rescued? Well, that depends. What is the model of your controller? Have you contacted TAC? How can we veryify if FUS is 1.9.0.0 or 2.0.0.0 on WLC 2504 ? my colleague delete both(Primary and Backup) FW from WLC 5508. Now wlc stuck in bootloader and looking for RTOS image. Can you guide how to upload FW on WLC now. It appears that your controller is running FUS AIR-CTXX00-K9-1-7-0-0-FUS.aes. Can i just save the FUS update for a later time, and upgrade just the Product Version to 8.5.131? Ideally I would upgrade the FUS first, then move onto upgrading the PV, however I have a small window of time and was looking at breaking up the tasks. Two things, I would highly recommend that you upgrade from 8.0.133.0 to 8.3.141.0 then 8.5.131.0. Avoid upgrading directly to 8.5.131.0 as its always good to be able to move back to a mid-tier version in the event you run into issues with the latest code. Keep in mind that the config files are very different as well, so make sure you make a backup of the config running 8.0.133.0 before you upgrade and one post upgrade on any version of the code. Next, I would highly recommend that you complete the FUS prior to 8.3.x and 8.5.131.0. or you will run into issues with certain aspects of the code (mostly feature sets) that depends on the FUS. There is always a risk to any upgrade task whether its hardware or a cloud deployment. Make sure to have a backout plan, your ITIL service manager will respect you more. Should I preload the AP’s with the mid tier version (8.3.141.0), reset, then preload with 8.5.131.0?